I must testify that an appreciation for religion-as-profession eludes me on bases of theological and practical dichotomies: Is it possible for one to be in the profitable business of praise? A band, for example, markets itself via global travel, the manufacturing and the selling of merchandise, and the employment of expensive equipment for studio albums. While I concede that this is necessary for self-perpetuation, I cannot always see its division from self-interest. The blessings are mine that it is not my responsibility to judge another’s intentions. Is it appropriate for me to applaud Sleeping Giant for their strong record, as a congregation applauds their choir? Do I spend my time writing about it, or do I instead write about my personal god? My understanding of this record, and therefore my review, stems from my conditional belief that it was neither for me, nor for Sleeping Giant. It was for their god. Okay, it’s time for me to descend the mount. 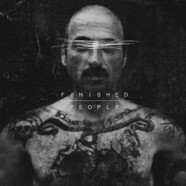 Sleeping Giant, a metalcore band born from the remnants of xDEATHSTARx, is not the star of their latest release, Finished People. They let scripture do much of the talking. The music, while versatile and evolved, remains in the foreground. Their subject assumes their sonic stage. These guys clearly belong to the straight-edge tradition. They possess the confidence of Remembering Never, and the aggression of Throwdown. A current charges their words. However, their lyrical sympathies often culminate in ambiguous summations of grandeur. To an intrepid Jericho-battle (“Death Knell”), with fists-in-the-air, anthemic praises of victory (“Son of God, Son of Man”), resolutions are seldom. Singer Tommy Green drives “Overthrown” and “Finished People,” which could have been condensed into one song. The guitars reminded me of any given Slipknot hook and bored me within a minute. Had it not been for Green’s hip-hop spiced bark, a la The Warriors, these early songs would have been deal-breakers. “Violence” is the asset of Finished People. It is a much-needed change of pace for an otherwise superfluous album. It is as surprising as it is poetic. Green raps over an ambient noise and peppered silence. This track showcases his command of language and a willingness from the band to experiment with echoes and atmospheres. “The Great Divorce” borrows its title from the paramount work by C. S. Lewis and serves to crystallize the allocution of Finished People: “… whatever you did for one of the least of these brothers of mine, you did for me. Depart from me, you are cursed…” It would have been easy for Sleeping Giant to preach to me. Rather, they gave me glimpses into their prayers. A gospel of alternative and one hell of a show.